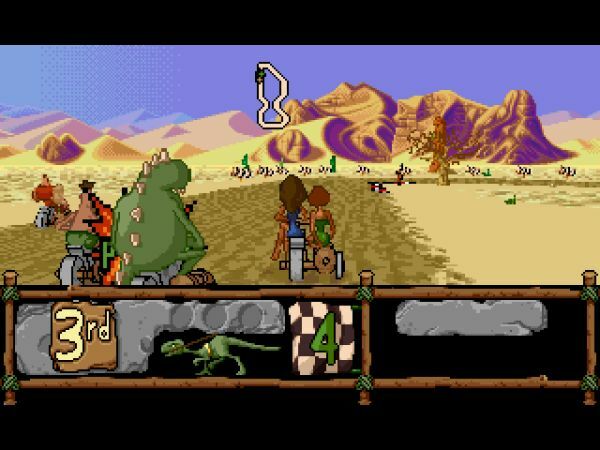 BC Racers is a racing game and a spin-off of the Chuck Rock series. Your goal is to obtain the Ultimate Boulderdash Bike by outpointing your opponents in an eight race competition. There's six riders to choose from (each with their own stats), as well as Easy, Medium, Hard and RockHard difficulty settings. Nitro can be used to speed ahead, and similar to Road Rash (1991, Mega Drive) you can punch fellow drivers to slow them down. Unfortunately, the racing is garbage, with the main culprit being a seriously choppy frame-rate that affects the accuracy of your turns. Likewise, the controls are unresponsive and it's a challenge to move onto the perfect racing line, especially when slowdown rears its ugly head! Bumping into the scenery is an all-too-frequent occurrence, and before long your bike will be wrecked, forcing you to use a continue. The combat does have an interesting mechanic whereby you can see the number of hits opponents can take before crashing out; however, the fatal flaw with this 32X port is that you can only punch to the right-hand-side of your vehicle! This means you're screwed if there's an opponent to your left as they can easily take pot-shots. Although there's only eight themed tracks, the layouts change depending on the difficulty setting; it's a brilliant idea that's shamefully ruined by uninspired track design and generic themes that lack scenic interest. Most of the time it's not even clear where you're supposed to turn, particularly in the Night Rally track, where the only illumination is your dim bike lights. As a whole, the racing is stale and could have used power-ups or boost pads to add some much-needed excitement. BC Racers on the Sega 32X has a long list of issues and the end product is a stressful experience where each turn is intense for all the wrong reasons. It's simply no fun when you're fighting against the game as well as fellow riders, and overall it's appalling how little care was put into refining the racing prior to release. 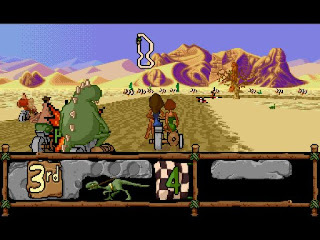 Random trivia: The Mega CD version of BC Racers was released in 1994 and allowed you to punch in both directions.